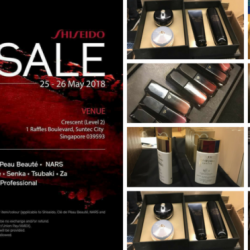 25 - 26 May 2018 Shiseido: Mid-Year Sale 2018 on Beauty Products from Shiseido, Cle de Peau Beaute, Za, Nars & More! Shiseido's biggest sale is back! Get your wallets ready to grab all the beauty goodies this weekend! Participating brands include Shiseido, Cle de Peau Beaute, NARS, Anessa, Ma Cherie, Senka, Tsubaki, Za and Shiseido Professional. Head down to Suntec City bright and early from 25 to 26 May 2018! 17 - 19 Nov 2017 Shiseido: Year-End Sale on Beauty Products from Shiseido, Cle de Peau Beaute, Za, Nars & More! So you think after war at Luxasia Festive Beauty Bazaar Warehouse Sale, you can go home and rest? Sorry, there's another sale that you CANNOT MISS!!! 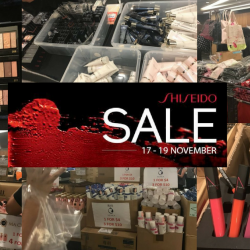 Go crazy at Shiseido Year-End Sale this weekend with amazing offers on beauty products from Shiseido, Cle de Peau Beaute, NARS, Za, Anessa and more! Get all your Xmas presents for your girlfriends there! The highly anticipated Shiseido Sale is back again! 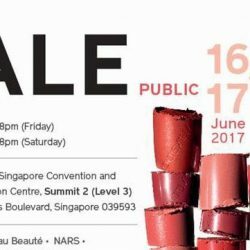 Happening from 16 to 17 June 2017 at Suntec City, dun miss it if you are a beauty lover! Participating brands include Shiseido, Cle de Peau Beaute, Za, Nars and more. Time to stock up on your beauty favourites! The highly anticipated Shiseido Sale is back again! Happening from 20 to 22 October 2016 at Suntec City, dun miss it if you are a beauty lover! Participating brands include Shiseido, Cle de Peau Beaute, ettusais, Nars, and more! We will see you there! The highly anticipated Shiseido Sale is back again! Happening this Wednesday and Thursday from 23 to 24 March 2016 at Concorde Hotel, dun miss it if you are a beauty lover! Participating brands include Shiseido, Cle de Peau Beaute, ettusais, Nars, and more! We will see you there! 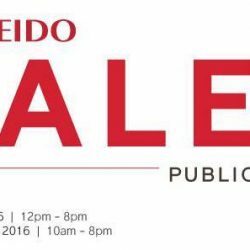 22 - 23 Oct 2015 Shiseido Sale 2015 Open to Public! The highly anticipated Shiseido Sale is back again! Happening this Thursday and Friday from 22 to 23 October 2015 at Concorde Hotel, dun miss it if you are a beauty lover! Participating brands include Shiseido, Cle de Peau Beaute, ettusais, Nars, and more! We will see you there!